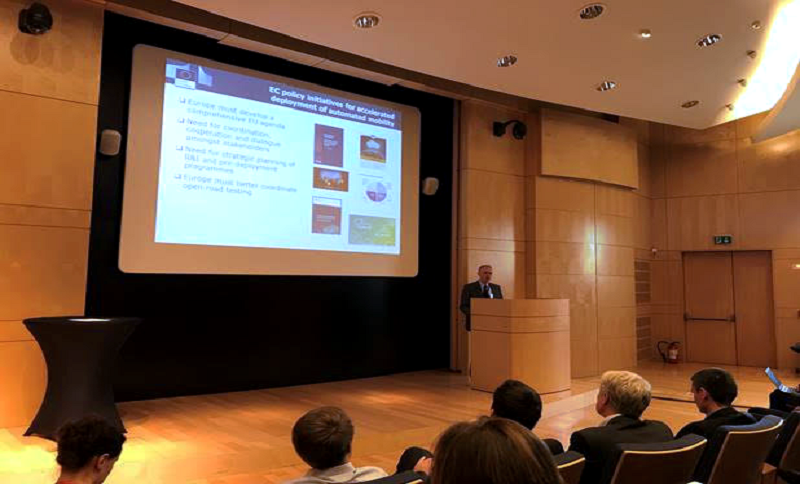 Over 30 stakeholders gathered in Brussels on 18 -19 October 2018 to launch the ARCADE project (Aligning Research & Innovation for Connected and Automated Driving in Europe), which will continue the work of CARTRE that came to its end in October 2018. This new EU-funded project seeks at supporting the cooperation between major Connected Automated Driving (CAD) stakeholders from the automotive, infrastructure, ICT and service provisions sectors. ARCADE also intends to promote the exchange of knowledge, lessons and experiences from past and ongoing activities at the national, European and international level. European Commission’s Project Manager Georgios Sarros opened the meeting by encouraging the consortium to work towards the achievement of the project’s objectives. Following his presentation, ARCADE coordinator Stéphane Dreher, from ERTICO ITS Europe, presented ARCADE’s expected impact and underlined the role of all partners involved. ARCADE will be actively involved in the organisation of the 2019 European Conference on Connected and Automated Driving that is taking place from 2-3 April 2019 in Brussels. The conference, organised by European Commission, is the third iteration of the 2017 Conference and the Interactive Symposium that took place in April 2018. Moreover, ARCADE seeks at involving public and private external stakeholders to support the alignment of national action plans, European and international activities and is currently receiving applications from associated partners to join the project.